Zbigniew Brzezinski did not begin his career as a geostrategist. He began it as a wunderkind. By the time he was 30, he had a young wife, a U.S. naturalization certificate, a Harvard Ph.D. (earned in three years), two books published by Harvard University Press, and concurrent posts at Harvard’s government department, its Russia Research Center, and its newly formed Center for International Affairs. Brzezinski’s initial specialty was understanding how the Soviet Union worked. His doctoral dissertation analyzed how the Soviet leadership used continual purges as an instrument of control, employing brutality for political ends. It drew widely on history, political science, and sociology, unpacking the enduring political patterns that not only governed the recent Soviet past, but also were likely to govern its future. It was in no way a policy book. It ends not with recommendations for the U.S. government, but instead by musing on how long such a system can endure. In his 30s, Brzezinski’s intellectual horizons began to shift. After he moved to Columbia University in 1960 and intensified his relationship with the Council on Foreign Relations, he wrote more explicitly about the U.S.-Soviet rivalry and U.S. policy. His 1965 book, Alternative to Partition, prescribed a U.S. approach to Eastern Europe and the Soviet Union that was a striking departure from then-current policy. Persuaded that the Soviet system would eventually be consumed by its internal contradictions, he argued that isolating the Soviets and their client states would only prolong the Cold War. Instead, he advocated reassuring the Soviets that the United States did not have military designs on them in order to infiltrate ideas into Eastern Europe that would undermine communism. It would accomplish the same goals as confrontation without firing a shot. Brzezinski’s ideas on Europe were not adopted in full, but they gave him both relevance and star power in Washington. He spoke personally with President Lyndon Johnson about them, he began to appear on television, and he served for a time on the State Department’s Policy Planning Council. His impatience with academia and his ambitions in the policy realm were laid bare when he chaired the Foreign Policy Task Force of Senator Hubert Humphrey’s unsuccessful 1968 presidential campaign. What followed Humphrey’s defeat, however, was not a defeat for Brzezinski. Instead, it may have been his period of greatest intellectual fertility. After two decades of writing about Russian totalitarianism, Brzezinski had become intellectually restless. In 1970, he wrote Between Two Ages: America’s Role in the Technetronic Era, an oddly titled but deeply insightful examination of how technology and mass communication would shape U.S. politics and society and the U.S. role in the world. Reread after more than 45 years, it has moments of shocking prescience. The next year, he traveled to Japan for six months on a Ford Foundation grant (arranged by Ford Foundation president and former national security adviser McGeorge Bundy) and wrote The Fragile Blossom, about Japan’s future prospects. There, the Soviet specialist turned his intellect toward a country with a language and history completely foreign to him. His purpose, made clear in his conclusion, was advising the United States how to shape Japan’s rise so that it enhanced U.S. security. The two books were the product of a rigorously systematic approach that compensated for his lack of deep background knowledge, and they marked a sharp break from his past as a Sovietologist. Upon his return to New York, Brzezinski also broke with being an academic. Befriending the financier David Rockefeller, he helped establish the Trilateral Commission, which brought together Americans, Japanese, and Europeans. As the commission’s executive director, he recruited a talented Georgia governor named Jimmy Carter. Though he had his choice of Democratic candidates to support in the 1976 election campaign, Brzezinski aligned with Carter when he was still an unknown. As Carter’s star rose, so did Brzezinski’s, and when Carter won the election, he named Brzezinski his national security adviser. In the White House, Brzezinski was known as a pugilistic cold warrior, and his hawkish reputation seemed well-earned by the Carter administration’s reaction to the Soviet invasion of Afghanistan. While Brzezinski maintained a strategic focus on defeating the Soviet Union, he often had a sophisticated approach to the Cold War rivalry. He sought to starve the Soviet Union of external support by drawing closer to Western allies, deepening ties between the West and the Global South, building closer ties with China, and resolving conflicts in the Middle East and Africa that provided opportunities for Soviet intervention. This 1977 memo to prepare President Carter for a summit with NATO heads of state is a remarkable portrait of Dr. Brzezinski’s worldview. While his understanding of Soviet conduct was deep, his greatest successes in the White House lay elsewhere—helping to negotiate the Camp David Accords between Israel and Egypt, to normalize relations with China, and to strike a new treaty over the Panama Canal Zone. He sparred with Secretary of State Cyrus Vance on arms control negotiations with the Soviet Union, often seeking to gain leverage over the USSR at the same time Vance was trying to improve the climate for negotiations. The Iran hostage crisis did more than mark the transformation of a stable ally into a destabilizing foe. Carter believed it doomed his presidency, and Brzezinski, who had established his primacy on intelligence issues and crisis response, had been unable to devise a solution while in office. Upon leaving government in 1981, Brzezinski stayed deeply involved in the policy world. In more than 35 years at the Center for Strategic and International Studies, his writing and advocacy had several sustained and interrelated themes. The challenge to U.S. leadership had three parts. One was deepening ties to generally democratic governments that were already favorably disposed to the United States, including in Western Europe and Japan. Brzezinski believed that it would be an error to take their support for granted, or to assume that their policies would automatically align with those of the United States. Most important was the third: deftly playing a unique global role promoting and guaranteeing Western unity while balancing and conciliating between rising powers in Asia. As described in his last book, Strategic Vision, the only way to do that was through building partnerships based on common interests with what he expects will be a democratizing Russia and an increasingly empowered China. How to hasten that transition was a problem that Brzezinski was never able to solve. Though he was cautious not to close the door to cooperation with Russia, he was also insistent on the need to oppose repeated Russian efforts to trample on its neighbors. The third theme on which he focused was China. Even when China was relatively weak in the 1970s, Brzezinski believed in the strategic imperative of keeping China closer to the United States than it was to the Soviet Union, and later to Russia. A solid Russo-Chinese bloc would not only have tremendous global sway, but it would frustrate U.S. intentions around the globe. Although united formally by Marxism, even in the 1960s he reported seeing any number of reasons for rivalry and friction between them. In his later years, he came to see both the importance and possibility of reaching understandings with China. "The Chinese are now more confident, full of pride, and justifiably so. So I’m not a pessimist, but I do worry occasionally that we have not asked ourselves often enough—which is what statesmen should ask themselves when dealing with others—how do my actions affect their actions? The fourth theme that drew Brzezinski’s attention was the problem of declining global order. During the Cold War, the United States sought to stabilize the developing world in order to keep out communism. Brzezinski’s attention to ending apartheid in South Africa, to the Arab-Israeli conflict, and even to U.S.-Iran relations fell into this rubric. But the end of the Cold War brought with it an unexpectedly robust complexity. U.S. politics became increasingly unruly, and he talked about a “global political awakening, in which people are motivated all of a sudden very intensely, and act politically on behalf of sometimes fanatical causes religiously or ethnically or otherwise.” The problem, as Brzezinski saw it, was not merely that a wide array of long-simmering inter-state conflicts threatened to erupt. It was also the prospect that intra-state conflicts and non-state conflicts would thrust the world into turmoil. He also became seized with global warming as a threat that would not be recognized until it was too late to stop. Speaking to an audience in Oslo in 2016, he worried openly about “the now increasingly vulnerable humanity” that would only act on climate after it was too late. It was a study in which he was deeply engaged until his final month, with an energy, a curiosity, and an intellect that had been scarcely dimmed by the passage of time. Dr. Brzezinski’s personal office is filled with notes of appreciation from presidents and premiers, some dating back more than 50 years. He received the Presidential Medal of Freedom, the U.S. Department of Defense’s Distinguished Public Service Award, Harvard’s Centennial Medal, and a number of honorary degrees from universities around the world. Dr. Brzezinski’s body of work is so large, there is no complete record of it. A selection of some of his most important books, Congressional testimony and articles can be found under Sources & Credits at the end of the page. Many who worked with Dr. Brzezinski wrote touching remembrances. 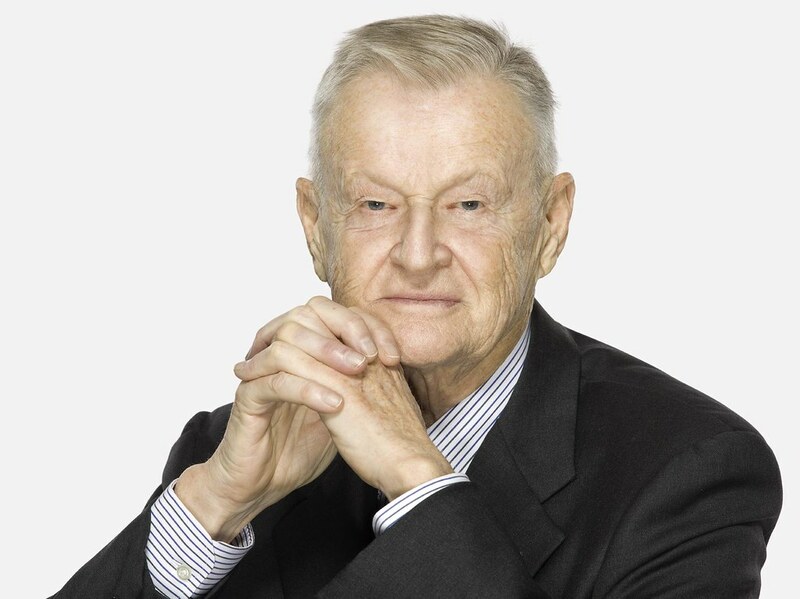 Zbigniew Brzezinski was a prolific author and scholar. He contributed books, articles, and testimonies for CSIS over many decades of service. To see a full list of his work from CSIS, click below. ​Note: The Grand Chessboard was republished in December 2016 by Basic Books and includes a new epilogue. “Giants, but Not Hegemons,” New York Times, February 13, 2013.